DYNAMIC FORCES® - DF SPECIAL - WEAPON H WEDNESDAY II! DF SPECIAL - WEAPON H WEDNESDAY II! It's Wednesday AKA NEW COMIC BOOK DAY and we've got an ALL-NEW offering for the fans today!!! WEAPON H #1 hits stands TODAY and we're kicking off the celebration with an ULTRA-LIMITED SIGNED VARIANT!!! DYNAMIC FORCES is proud to present, WEAPON H #1 RARE TRADING CARD VARIANT ULTRA-LIMITED GOLD SIGNATURE SERIES SIGNED BY Greg Pak!!! The Weapon X Program has done it again! At the cost of their own destruction, they've completed their biggest and possibly most dangerous experiment yet... With the strength of the Hulk and the rage and claws of Wolverine comes WEAPON H! It's been some time since Weapon H escaped and destroyed his creators. Now, our hero is on the run, as he tries to escape his mysterious past and seclude himself from the rest of society. But when a new kind of Wendigo threatens the lives of others, will Weapon H be able to shirk his responsibility? Does any of his humanity remain? Only the creative team of Greg Pak (INCREDIBLE Hulk) and Cory Smith (X-Men BLUE) can give you the answers! 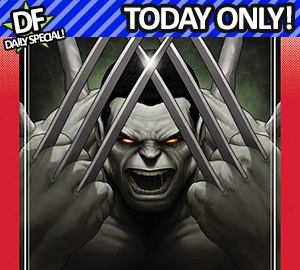 This edition will be ULTRA-LIMITED to just 21 GOLD SIGNED COPIES IN THE WORLD in honor of the FIRST APPEARANCE of WEAPON H in TOTALLY AWESOME Hulk #21 and ULTRA-LOW EVENT PRICED at $35 in honor of the 35th anniversary of the FIRST APPEARANCE of WILLIAM STRYKER in Marvel GRAPHIC NOVEL #5 (January, 1983). This ULTRA-LIMITED gem will come with not one, not two, but THREE RANDOMLY CHOSEN INCENTIVE AND/OR VARIANT EDITION Marvel COMICS!!! Be sure to lock yours down today!! !